The band formed in April 1988 as a trio of frontman Mike van Mastrigt, guitarist Ron van de Polder and drummer Aad Kloosterwaard adding bassist Corzas in January 1989. This line-up recorded the 'Perpetual Damnation' demo on March 17th 1990, involving four originals and an unlisted cover of SLAYER's 'Praise Of Death'. Sales of the tape were strong, with over 1800 sold in 18 months, and SINISTER toured supporting ENTOMBED and DISHARMONIC ORCHESTRA. Seraphic Decay Records delivered a three track 7" EP in August 1991, Swiss label Witchhunt Records, an imprint noted for picking out influential bands, also weighed in with a 7" single 'Putrefying Remains' in September and the following year Sicktone put together two tracks as a split 7" single shared with Dutch / Swedish alliance MONASTERY. This outfit notably comprised SINISTER members Ron van de Polder and Aad Kloosterwaard in collaboration with ENTOMBED's Lars Rosenberg. 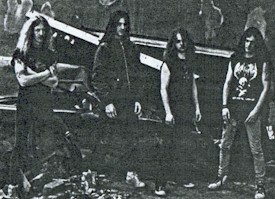 Corzas left in May 1991 and bass duties were handed over to SEMPITERNAL DEATHREIGN's Frank Faase. Another line-up shuffle saw Ron van de Polder moving over to bass as SINISTER added second guitarist André Tolhuis (a.k.a. André Tolhuizen) of VULTURE. Their second demo, 1991's Sacramental Carnage, had secured enough interest to land a deal with Nuclear Blast releasing their debut album 'Cross The Styx'. A pro printed four panel cover with lyrics. The tape is a simple studio tape. A xeroxed four panel cover. 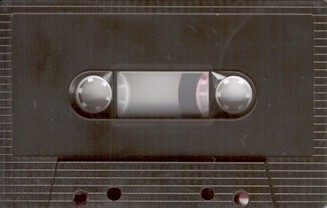 The tape is a simple studio tape.